Budding young actors at The Sixth Form College, Solihull have been performing for the practical exams this week, splitting into groups to produce four dramatic productions. 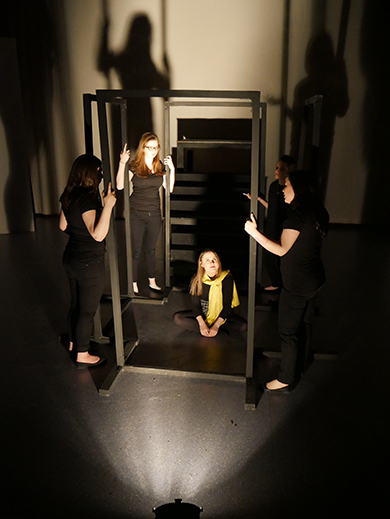 The second year A level Drama students performed their interpretations of ‘The Tinderbox’, ‘Girl, Interrupted’, ‘The Book Thief’ and ‘13 Reasons Why’ – click on each image on this page to see more photos of these performances. 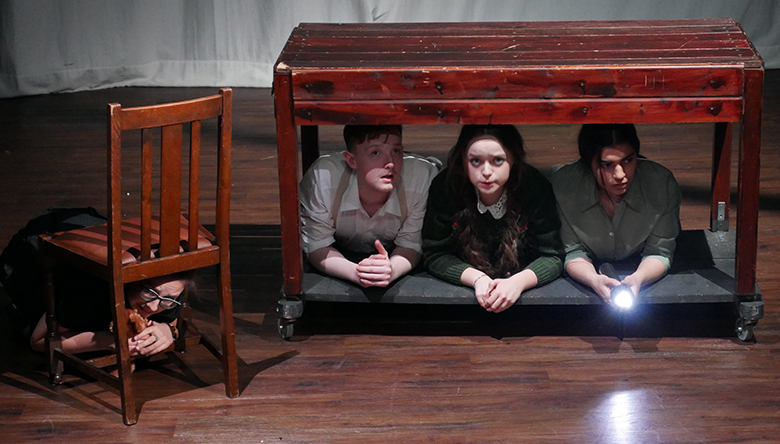 The practical exam is devised and each production is a creative adaptation of a story or novel that the students shaped into a stage version, using improvisation, physical theatre techniques and scripting. As such, the students not only acted in these short productions (of approximately 30-minutes in length each), but were also responsible for script, costume, set, lighting and sound. 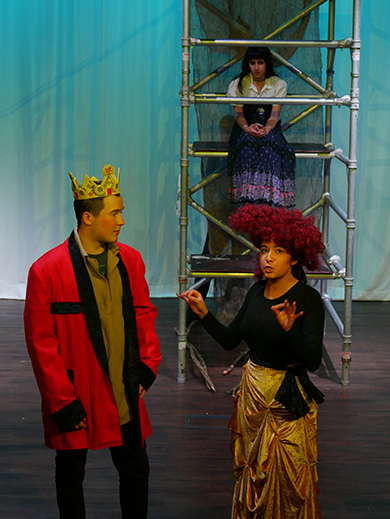 ‘The Tinderbox’ by Hans Christian Andersen was brought to life by students Thomas Corcorran, Richard Geen, Sophie Hughes, Khasim Mahmood, Bel Saied and Mia Thomas, who set up a tower as part of their set to showcase the fairytale. ‘Girl, Interrupted’ by Susanna Kaysen is best known for its transformation film. A group of six students gave it their interpretation; they were Bethany Carless, Kiera English, Mollie Gates, Hannah Gooden, Mei-Ling Rhodes and Charlotte Wilson. They used wooden frames to bring a physical theatre element to their performance. ‘The Book Thief’ by Markus Zusak was the choice of Seamus Carrie, Abigail Cody, Olivia Furness, Thomas Manning, Sahar Rafiq and Bronte Sullivan. They made good use of set and costume to bring the war years to life. 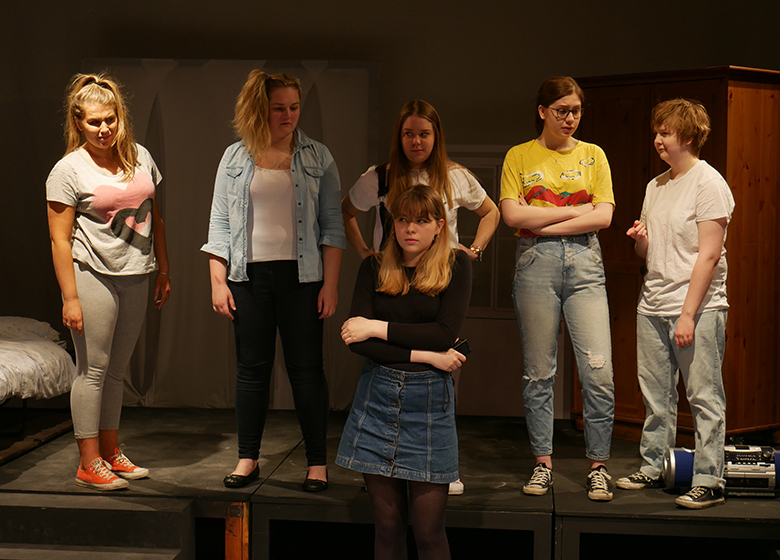 The final assessed performance was ’13 Reasons Why’ by Jay Asher, which was performed by Eve Banner, Lara Chiswell, Charlotte D’Albert, Imogen Padget, Alexandra Powell, Sarina Saqib and Nine Semple. They explored hard-hitting issues like bullying and suicide in their production.